The greenery wedding trend began in 2016 and it has only grown since Pantone named Greenery as their Color of the Year for 2017. It’s a fresh color with a wild and organic look symbolizing abundance, so it’s no wonder than it has been so popular for such special events. Using greenery instead of flowers gives you more freedom to play with textures and shapes than floral blooms, and it is also much less expensive. 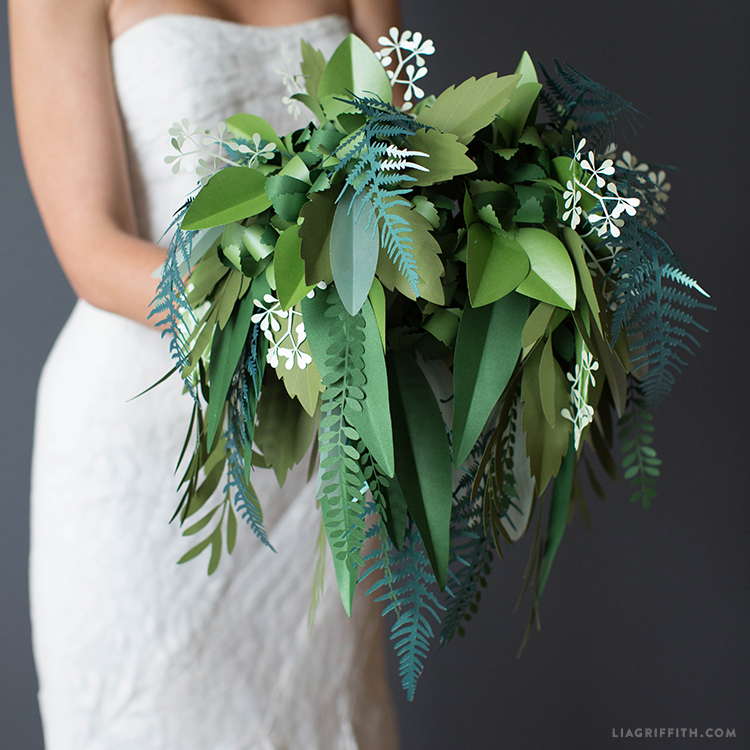 We teamed up with our friends at Paper Papers to show you how to make your own greenery wedding bouquet with gorgeous shimmer paper. 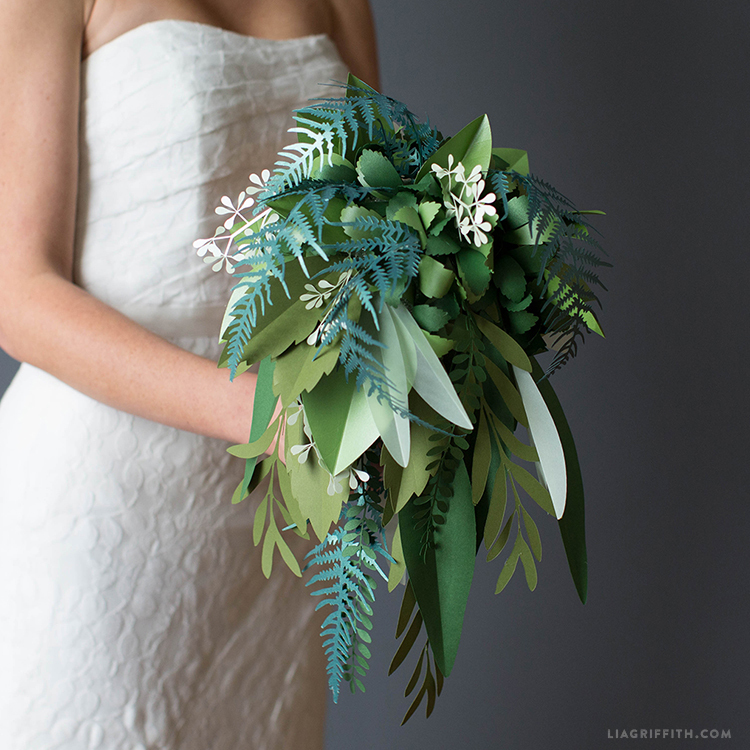 Our botanical bridal bouquet features ferns, seeded eucalyptus, eucalyptus leaves, olive branches, lemon leaves and succulents. My best tip for making paper botanicals is to use text weight paper rather than cardstock. The lighter paper is easier to curl, and once you attach all the leaves to the foam base it will look much more natural than cardstock. 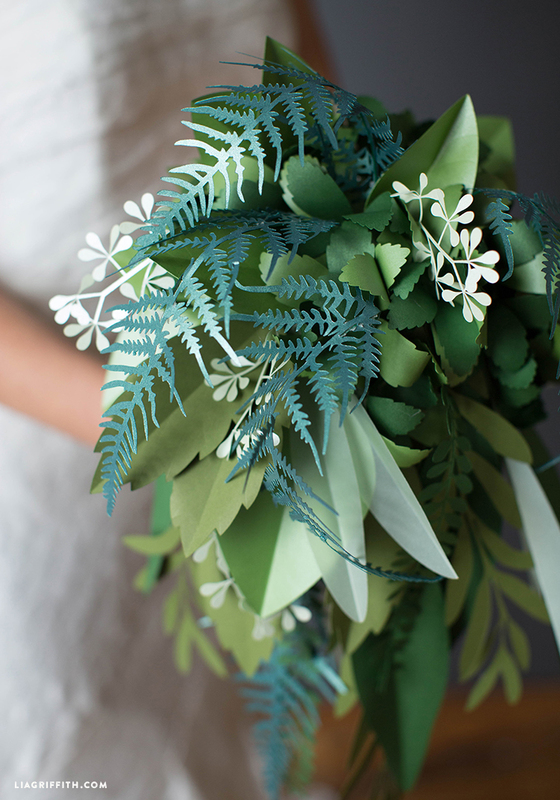 You can cut the leaves in any shades of green that you like, or use the exact papers that we used here. 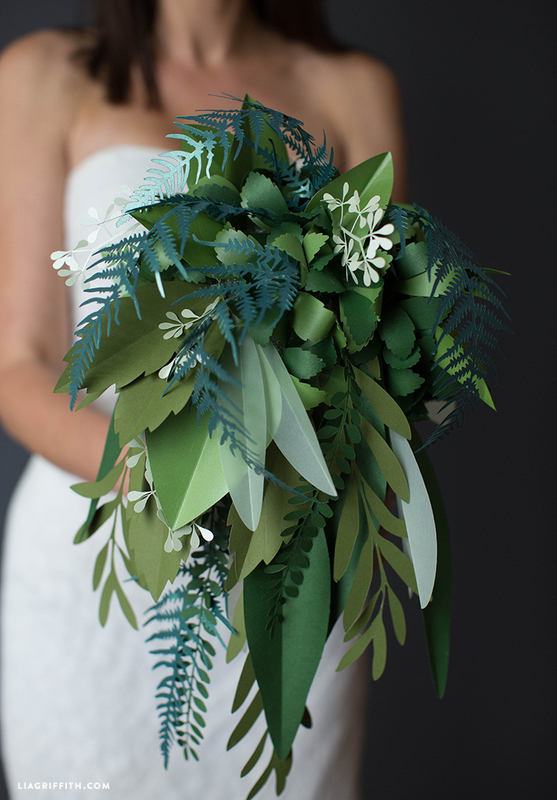 Head over to our post on Paper Papers website to download the patterns for this greenery wedding bouquet, then follow our video tutorial below as you craft! The base of the bouquet is made by covering half a foam ball with tissue. The tissue will make it so that none of the foam will show through, plus it is much easier to glue the leaves to tissue rather than the foam. DIY is best taught visually, so watch our full video tutorial below to make your own botanical bridal bouquet. Is this correct? The leaves look like they are green to me. HI! i cant find the amount i need to cut from each leaf..
Hi! The video has very detailed instructions, but I didn’t count the exact number as I went. I made two bouquets in the end and used a different combination on each. Where do I find which paper color for each leaf? There’s a link under Materials listing the colors that will lead you directly to the paper site. I just joined and have been watching your videos. I see that you mentioned you use the Cricut Explore, can that machine cut the crepe paper pedals? Or is it only for the thicker paper flowers? Welcome!! I use the Cricut for my paper flowers and leaves (I actually use text weight paper– cardstock doesn’t curl as nicely!) The new Cricut Maker machine cuts crepe paper beautifully but I’ve never had success cutting it on the Explore. Hello Lia, absolutely stunning! Question for you. You have videos in various places it seems. I wonder if you have ever done columbines? My daughter is recently engaged and a flower she wishes to include in the festivities is the Colorado Columbine. Also another question…does crepe paper punch easily? Hi Heather, great suggestion! We’ll add that one to our idea list– it would look beautiful in crepe. I haven’t tried to punch crepe much, but I suppose it depends on the brand and shape! What a great tutorial Lia, thankyou. Now I just need more hours in the day. I look forward to trying this project once I get a few other ones finished. I hear you, I could use a few extra hours each day, too!! Where do I find how many of each leaf I need? The video has very detailed instructions, but I didn’t count the exact number as I went. I made two bouquets in the end and used a different combination on each. It’s lovely, I would be proud to walk down the aisle carrying that bouquet or any of the bouquets you’ve made. This is just beautiful! I was wondering if the Cricut pastel shimmer paper would work as well as paper paper. Oh yes! We love Cricut’s shimmer papers. Where are the SVG files?